rec. 25-27 August 2005, Chapel of Merton College. The Viol consort is a curiously English genre, designed neither for sacred use nor for the edification of listeners. It is music primarily for the enjoyment of the participants. As such, music for viol consort can sometimes be written off as simply music for amateurs. But whilst, in 17th century England, consort music might have been played by non-professional musicians for their own enjoyment, such pieces are neither simple nor unrewarding for the listeners. On the contrary, the genre is surprisingly complex. Viol consorts subsist on music that is consistently polyphonic and in which each player is an equal. There are no moments of melody and accompaniment here, just continuous counterpoint - the textures can be dense but always rewarding. John Jenkins wrote his six-part Consorts in the 1620s at a time when lighter textures were coming into vogue from Italy. And by the second half of a century, with a new King who was heavily influenced by the French style of music, these viol consorts would seem heavily out of date. The delightful rigours of continuous counterpoint would be described as �clog�d with somewhat of an English vein�. Not everyone would have agreed, Purcell�s Viol consorts being a remarkable late flowering of the genre. Not a lot is known about John Jenkins� early life; he seems to have had some sort of connection to aristocratic patrons in Norfolk (in Dereham and Hunstanton). He performed for Charles I and took part in Shirley�s masque The Triumph of Peace in 1634. At first glance the music can be rather dense, but in the hands of a group like Phantasm textures begin to clear and we start to appreciate the balanced conversation between six equal individuals. Jenkins applies varied articulation and judicious use of exotic harmonies to guide us along the way, but as with all good conversation it is not so much the ending as the journey itself that is the point. 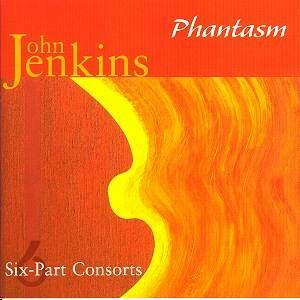 On this disc, Phantasm play all of Jenkins six-part Fantasies along with two pavans and two In nomines. Such a concentration of six-part music can seem a little forbidding, but their touch is surprisingly light and engaging at times. Liveliness of articulation is one of their strong points and textures never get clogged. Despite the dark mahogany sound of the six viols, the players manage to keep a notable clarity of line. Phantasm are a remarkably international group. Founded in 1994 by the American viol player Lawrence Dreyfuss, the other three regular members of the group are American, Scots and Finnish. On this disc they are joined by another Finn and an English woman to make a remarkably cosmopolitan line-up. Perhaps one element of the group�s remarkable cohesion is that all the players originally studied modern instruments. Dreyfuss and his group were inspired by the example of some of the great 20th century string quartets and seek to apply this sort of communal music-making to ensembles of an earlier era. Jenkins� music does not have the inspired naughtiness of his contemporary William Lawes; although it can have a sombre tone, engaging moments are never far away and there are occasional exuberant outbursts which the players relish. The recording was made in Merton College Chapel, but you would not know it. The recording engineers have caught the viols perfectly, giving them space and bloom without the unnecessary boom of the large acoustic. Other groups have recorded these pieces interspersed with Jenkins� music for other forces, to provide the listener with some sort of aural relief. But with performances like these, such relief hardly seems necessary. Just put the disc in the CD player, pour yourself a glass of wine, lower the lights and sit back and revel in the brilliant conversation of a group of old friends, familiar enough to take liberties but always balanced and civilised.